Well, 2013 was certainly an eventful year in the world of pygmy hippo PhD research! 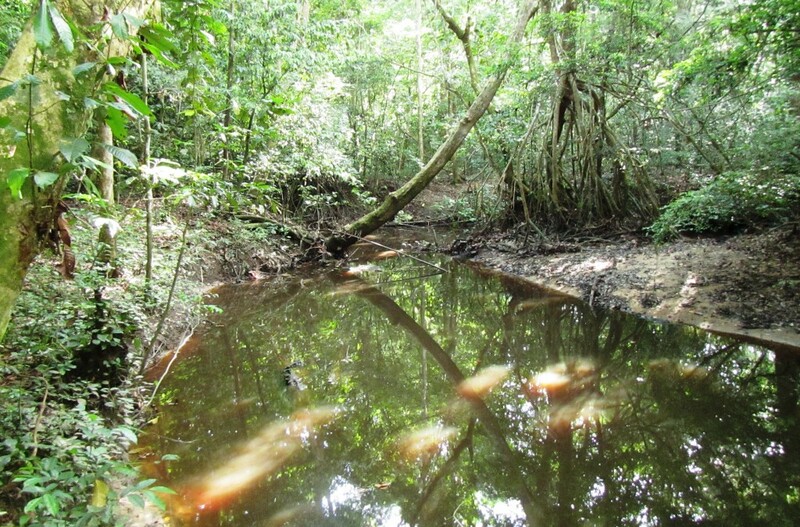 During the first three months preparations were continually underway for the first IBREAM field expedition to the Taï Forest in Côte d’Ivoire since 2010. I was busy organizing and ordering things and making sure paperwork and documentation was in order in Australia; research partners and field assistants already on the ground in Abidjan and Taï Forest were organizing the research camp, applying for permits, setting up camera traps, following pygmy hippo paths, collecting deposited hippo dung samples, and tackling the formidable task of constructing hippo traps using natural forest materials. An occasional glimpse of one of these rare and secretive animals on the camera traps was always an exciting development, and progress on the ground was impressive within just a few short months in early 2013. In late March the time had finally come for me to make the epic journey from Perth to Abidjan, the largest city in Côte d’Ivoire, complete with six boxes of densely packed specialized equipment and field gear for pygmy hippo research in the rainforest. Although many think Abidjan is also the capitol city, it is actually Yamoussoukro, about 200km inland. Then the “real” adventure began. Côte d’Ivoire is definitely different to anywhere else I have been on this earth (and I have been to more than 50 countries in my lifetime), bustling and vibrant, chaotic and colorful, busy and animated. 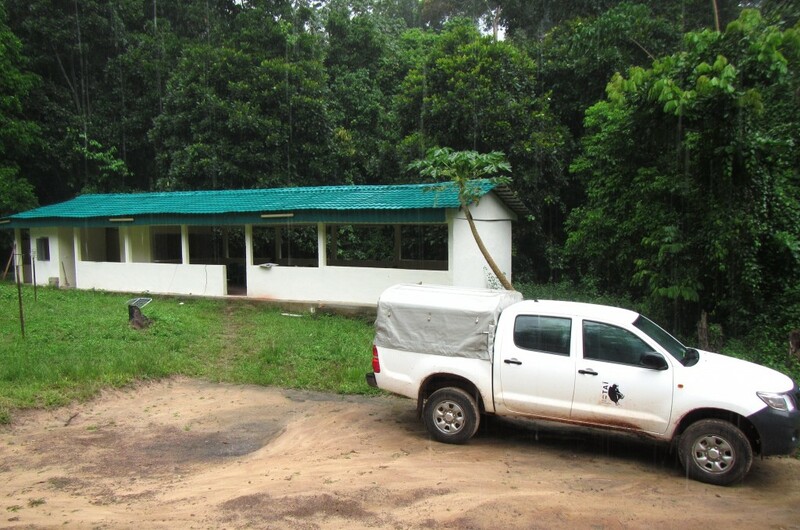 The first stop was Centre Suisse des Recherches Scientifique (CSRS), where I would be staying for a week in order to purchase equipment and procure additional supplies locally in Abidjan before heading to Taï Forest. I also met my collaborators and local supervisors, Dr Inza Koné and Dr Karim Ouattara, who were both incredibly kind, helpful, generous, knowledgeable, and enthusiastic about the pygmy hippo! While in Abidjan I also paid a visit to the zoo’s resident pygmy hippo Mia, met several other international and local researchers, collected the appropriate government permits and visas for our project to function legally, enjoyed some of the traditional local cuisine like aloko (fried plantains with chili) and attiéké (manioc), and took a quick trip to Grand Bassam to relax on the beach. On April 13th the two-day, 12 hour journey from Abidjan via Yamoussoukro, Daloa, Guiglo, and Taï Village began along a route that contained enough potholes to last a lifetime. The last 100km or so of the journey is dirt road, which quickly translates to mud-slick road when the rains come. And when the rains come, boy do they come! There were a few occasions during my stay in the Taï Forest when I thought we might all wash away, but it was also quite refreshing since the weather was continually hot and incredibly humid. Taï Forest itself is incredibly beautiful and one of the last remnants of contiguous primary rainforest in the Upper Guinean Rainforest Ecosystem, which also stretches through Liberia, Sierra Leone, and Guinea. The forest is filled with a cacophony of insect serenades and is teeming with wildlife, including myriad colorful butterflies and beetles; diverse birdlife like the black-casqued hornbill, pied hornbill, green turaco, kingfishers and colorful sunbirds; assorted primate species comprising red colobus, olive colobus, spot-nosed monkey, sooty mangabeys, Diana monkeys, Campbell’s monkeys, and chimpanzees; numerous small antelopes including Maxwell’s duiker, the black-backed duiker, and the rare Jentink’s duiker; as well as less common species like the forest buffalo, forest elephant, and of course the pygmy hippo! Our time in the forest was filled with challenges and difficulties but was also exciting and rewarding. We lived without electricity or communication with the outside word, meaning we were not distracted by our smartphones, internet, or TV and could concentrate on tracking pygmy hippos. 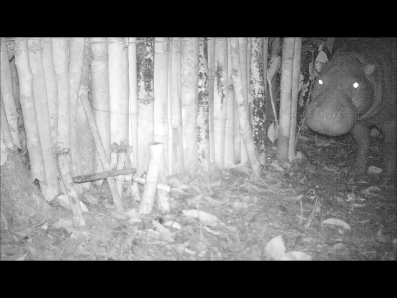 We were fortunate enough to see several of these elusive animals on camera trap photos and video, both in the forest and visiting the recently constructed traps. They are beautiful and silent, a real creature of the forest. Unfortunately despite a concerted team effort to construct traps and attract hippos using fresh yam baits, none of the animals were captured during my time in the forest. The plan was to capture and anesthetize several hippos and fit them with GPS telemetry collars for a ground-breaking research project studying their ecology, home range, distribution, and behavior in the wild. However, excellent progress was made toward this eventual goal, and many hippo dung samples were collected for an ongoing genetics research project currently being undertaking by an Ivorian PhD student. After an eventful month of exploring and learning in the forest, I returned to Perth to continue the non-fieldwork portion of my PhD research, taking many wonderful memories with me and leaving some new friends behind. In August and September of 2013 I subsequently travelled to Europe to attend a conference and to meet several people involved in the ex situ part of my research concerning pygmy hippo health and reproductive issues. My first stop was Zoo Basel, Switzerland, where the International Studbook for the pygmy hippo has been maintained since the first edition was published in 1975. 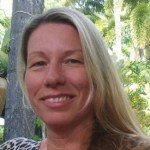 I met with Beatrice Steck, studbook keeper, and gathered data concerning various health issues amongst captive pygmy hippos worldwide as records dating back to the mid 1950’s are stored at their facility. Zoo Basel also currently houses a pygmy hippo pair, Also and Ashaki, whom I also met. 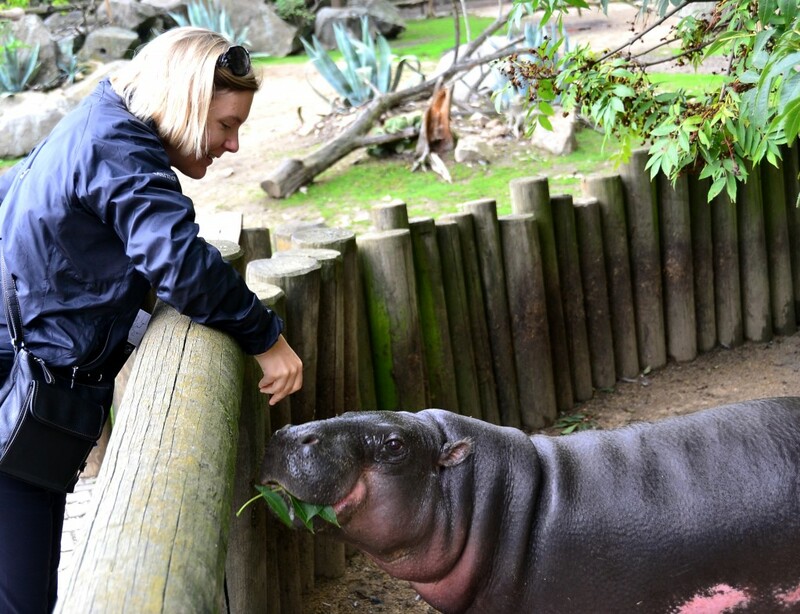 My next destination was the Czech Republic, where I participated in the week-long 31st World Veterinary Congress in Prague and also visited the pygmy hippos at Zoo Jihlava, Totoshka and Terezka. Finally I travelled to Berlin, Germany, home to the Leibniz Institute for Zoo and Wildlife Research, a group of researchers and veterinarians who have recently conducted several important studies investigating captive pygmy hippo reproduction and polycystic kidney disease. I also visited the Berlin Zoological Garden and was personally introduced to their three pygmy hippos, Joseph, Maria, and Debby. In Berlin I also organized a dinner and meeting with Dr. Knut Hentschel, one of the two original pygmy hippo researchers in the Taï National Park. Knut Hentschel and his colleague Waldemar Bülow both worked in Côte d’Ivoire in the early to mid-1980’s and were the first (and so far the only) researchers to successful trap, anesthetize, and place telemetry collars on wild pygmy hippos. 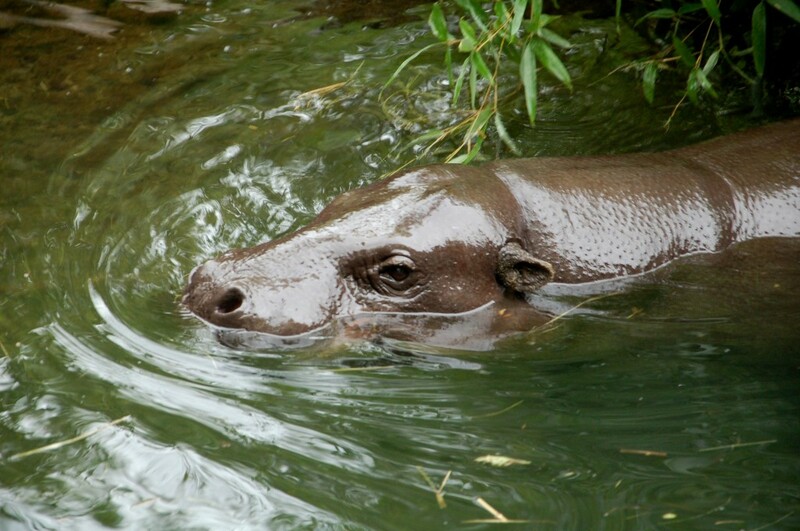 Their original research serves as the basis for most of what is currently known about the pygmy hippo in the wild, and their work is highly respected and referenced in the pygmy hippo and West African wildlife conservation communities. Knut was an extremely interesting and knowledgeable person who entertained me for hours with recounts of his adventures and accomplishments in Côte d’Ivoire and neighboring Liberia during his six years of living in West Africa. He gave me all the “insider tips” for successful pygmy hippo tracking and capture, and he even volunteered to come back to Taï Forest whenever the next phase of our research takes place in order to help us! He was a very likely able fascinating person. I returned to Perth in October and have since continued to gather data for my pygmy hippo health study while conducting more “traditional” PhD work, which mostly means reading and writing. However the less-glamorous parts of a PhD are just as important as the exciting travel, fieldwork, and international animal-filled adventures. 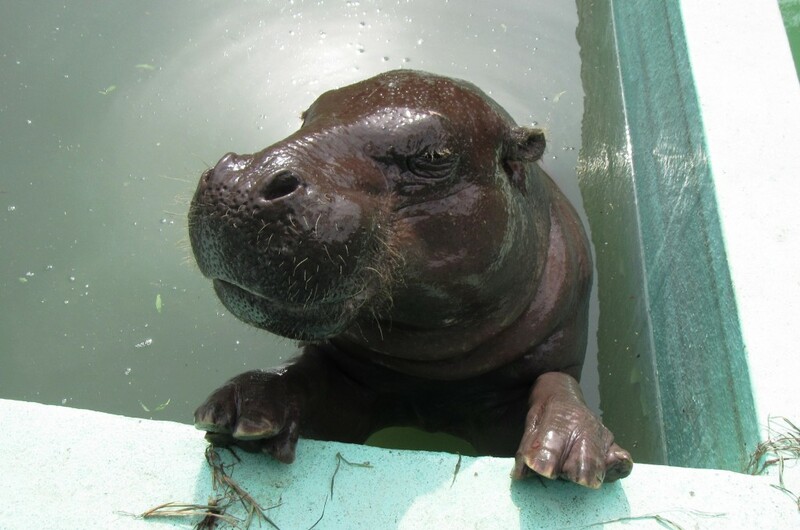 I am looking forward to an interesting and productive time in 2014, when I will spend some time in the USA at several zoological facilities that house pygmy hippos in addition to continuing to collaborate with IBREAM pygmy hippo team members in Côte d’Ivoire. A hippo new year to everyone!